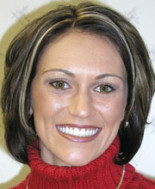 Veneers allow the team at Dental Care Bridgewater to change the appearance of your teeth in as little as two visits. Veneers are great for teeth that are worn, broken, chipped or discolored. They work extremely well to straighten teeth that are crooked without the use of braces. For our veneer cases we use DaVinci Dental Studios, the lab featured on the ABC hit television show, Extreme Makeover. See the finished treatment before you start! Every patient who visits our Bridgewater, New Jersey office gets a free computer image taken. This way you can see and compare the “before” and “after” picture for the best idea of what a new smile would look like. We can show you how you will look with your teeth whitened, straightened, spaces filled, as well as discolored fillings replaced and changes to the size and shape of your teeth.